THE READING WITH ROVER STORY! Once upon a time, in the town of Bothell, Washington, there was (and still is) a Librarian named MieMie Wu. MieMie wanted to make reading more fun for kids because she LOVED reading and she knew how important it was for children to love reading too! MieMie heard about a program in Utah called R.E.A.D.® where kids read aloud to dogs. 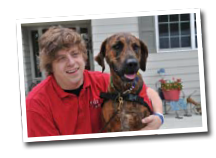 R.E.A.D.® stands for Reading Education Assistance Dogs. Through R.E.A.D.®, MieMie learned that kids who really needed help reading had improved their skills and confidence when they were assigned a reading assistance dog. MieMie thought that having kids read to dogs was WAY cool because dogs don’t judge when kids read aloud. So she set out to start a similar program in Washington and she named it “Reading with Rover”. MieMie needed help getting good dogs and kind people to volunteer so she contacted a nice lady named Dotti Snow. Dotti had Pet Partners® registered therapy dogs that went to hospitals to visit sick people. Dotti thought MieMie’s idea was GREAT and offered her therapy dogs as reading assistence dogs! MieMie knew LOTS of dogs were needed for the Reading with Rover program – so she called a dog trainer named Becky Bishop. Becky, like Dotti, had two therapy dogs of her own: Boomer and Moose. Becky was happy to help MieMie find more Reading with Rover teams. Becky, as a dog trainer, is in the business of helping families teach their dogs good manners, something all dogs need, especially Reading with Rover dogs! And so the Reading with Rover story began and it continues today. WHERE IS READING WITH ROVER NOW? Just for fun, Reading with Rover is also doing reading sessions at libraries and bookstores around the Pacific Northwest. Several times each month dogs can be found in the children’s section of the bookstores, for example. Kids are welcome to pick out a book, pick out a dog and sit, down, stay and read, read, read! This is a great opportunity for people who want to volunteer with their well-mannered pooch and only have evening or weekend hours available to participate. We have lots of children who want (and NEED) to participate in the Reading with Rover program in schools and other venues. We NEED dogs and nice people to help fill this need. It’s really fun and rewarding to be involved and to be a Reading with Rover Team. If you want to get involved or would like to know more about Reading with Rover you may contact Becky Bishop at www.puppymanners.com or visit the Reading with Rover website at www.readingwithrover.org.